SwRI was founded by Thomas Baker Slick Jr., an oilman, rancher and philanthropist, who convinced a group of scientists and engineers to move to San Antonio and pursue revolutionary methods to help solve technological and scientific challenges. 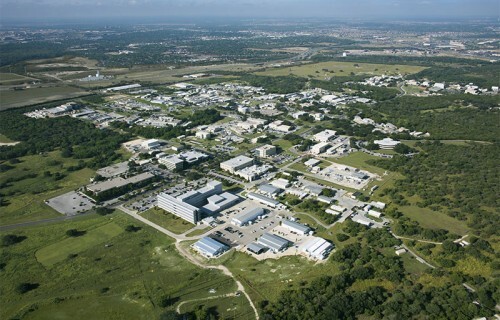 Just as San Antonio has grown into the now-seventh largest city in the country, the Institute has grown in stature from that auspicious beginning to realizing his vision of an internationally recognized scientific research center. A large portion of our 2,800 extremely dedicated engineers and scientists in San Antonio (and other offices throughout the country) have contributed numerous aviation and aerospace innovations affecting both civilian and military air travel around the world. We have made flying safer, increased the lifespan of aircraft, helped investigators understand what went wrong when accidents have happened, and ultimately have contributed to a better understanding of the origins and intricacies of the planet and our solar system. Closer to Earth, we work with aircraft manufacturers and modification facilities to provide specialized engineering expertise in design, analysis, and testing of aircraft. We help develop and design fuels and lubricants that are effective in extreme weather conditions. We also help filtration manufacturers design and implement filtration systems to keep foreign particles from obstructing those fluids and keep aircraft in the air. Drawing on our long history of evaluating the physical properties of conventional and unconventional aviation fuels, we also operate the first independent aviation filtration test facility available to the aviation industry to evaluate bulk storage and distribution filtration systems for both commercial and military applications. The test facility helps fuel-handling facilities develop techniques to remove contaminants and ensure a smooth flow from storage tanks to aircraft fuel tanks. Additionally, we have invested significant resources in state-of-the-art testing facilities and equipment to evaluate aviation fuel filtration components and systems. We have conducted myriad specialized projects for the U.S. military and even other allied countries to help keep warfighters safer in the air as they deploy on missions around the world. We provide engineering services in engine health management, control systems, propulsion, and imaging sensors and sensor fusion. We conduct technical support operations for the U.S. Air Force’s Aircraft Structural Integrity Program (ASIP) that includes providing complete analysis of the aircraft material and airframe testing. Our engineers have helped extend the useful life of military aircraft by re-engineering the 1950s- and 1960s-era analog avionics of aircraft such as the B-52 bomber, T-38 trainer and A-10 close-air support fighter using new, digital instruments that can add satellite communications and the capability to deploy precision-guided “smart” weapons. Other aviation-related work at the Institute involves simulation and robotics. Our engineers developed a simulator for refueling boom operators of military tanker aircraft that allowed realistic training in an inexpensive, ground-based setting. We also developed a “smart” depaint robot that can remove coatings without damaging the lightweight but sensitive structural composites used to build modern military aircraft. Beyond the aviation industry, for more than three decades, the Institute has been a leader in space science research and in the development of spacecraft instrumentation, avionics and electronics for both government and industry clients. We have developed in-situ and remote-sensing instruments that have flown, are flying, or are under development for flight on numerous NASA and European Space Agency missions. Avionics systems developed here have flown without a single on-orbit failure on more than 50 government and commercial missions. Institute-designed and -built components are included on missions to Mars, Saturn, comets, Pluto, and many others. Our scientists are principal investigators on multiple missions that help us understand how our solar system formed and give us a better understanding of how our planet interacts with the rest of the solar system. Our engineers have solved a number of vexing problems in space flight, including the dynamic movement, or “sloshing,” of liquid rocket fuel during launch, a device for “weighing” astronauts in the microgravity of space, and a fire extinguisher for the Apollo space capsule that first carried astronauts to the Moon and back. The latter was developed after a fatal fire in an Apollo capsule during pre-flight training of astronauts. The Institute was inducted into the U.S. Space Foundation's Space Technology Hall of Fame in 1998 for our temper foam technology, a polymethane foam seat-cushioning material developed originally in the early 1970s for NASA to counteract the discomfort associated with flight crews having to sit for long periods of time. Our experts in mechanical and materials engineering, ballistics, computational fluid dynamics, and impact modeling played a key role in determining the cause of the Columbia space shuttle explosion in 2003 andin NASA’s subsequent space shuttle return-to-flight program. Within a week of the accident, our engineers used a compressed-gas gun to fire projectiles made of the shuttle fuel tank’s insulating foam material against targets that contained heat-resistant tiles from the orbiter’s underside and segments of heat-resistant carbon-carbon material from the leading edge of the orbiter’s wings thereby demonstrating the cause of the accident was the foam material hitting the shuttle’s wing. During our 67-year history, Southwest Research Institute has been recognized for its many aviation and aerospace technologies, advances that have made flying more enjoyable, allowed aircraft to reach areas of our globe and solar system not previously visited, and most importantly, made flying and even space flight safer. As you can see, Southwest Research Institute has made—and continues to make—significant contributions to San Antonio’s proud aviation history. Article by Walter D. Downing, P.E. Mr. Downing directs the operations of Southwest Research Institute’s technical divisions and administers internal research, capital equipment, and other resources and services. He joined SwRI in 1979. UTSA Reception announcing the establishment of the Dee Howard Memorial Endowed Faculty Fellowship in Mechanical Engineering. Dee Howard: What’s Stopping You? This blog chronicles the rich history of San Antonio and the surrounding region’s role and leadership in civil and military aviation and aerospace, and the men, women, companies, and institutions that contributed to that history.